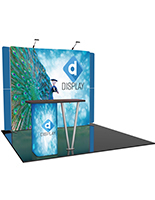 Looking to give your booth a contemporary feel? 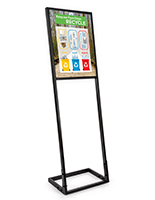 Our SEG graphic displays, also known as push-fit fabric graphics, have all the fixtures needed to create a presentation with seamless edges and an overall crisp appearance. Choose from walls, panels, and countertop designs. The fabric frame systems achieve a continuous look with their frameless façade, and it's what sets them apart from other booth backdrops and banners. 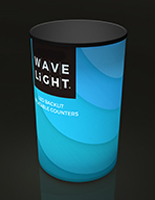 The portable countertops have additional storage and the SEG graphics on the front will make your exhibit pop. So, what is SEG? Silicone edge graphics (SEG) are printed on special tension fabric using the high-resolution dye-sublimated method that is then finished with a thin silicone strip at the edges (sewn directly into the graphic). 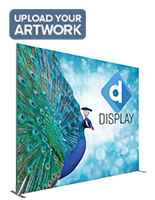 These graphic displays have special frames with flexible strips that are then pressed into recessed grooves or extrusions — which creates the seamless appearance. Fixtures are available with backlit illumination or without. You can submit the artwork you’d like and we’ll take care of the rest. 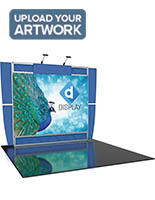 Vibrant SEG graphic displays enhance your booth and add a modern feel to the environment. Why should I choose silicone edge fixtures over others? 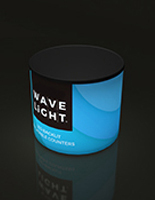 SEG graphic displays are made from a lighter material than traditional displays. This makes them easier to transport to various conventions or expo events. The extrusions help hide the sewn line, giving each image a continuous appearance — meaning, less frame is showing. Our freestanding models, tabletop light boxes, and portable counters are essentially “all picture” with little to any border showing. The dye-sublimation printing process gives your artwork a vibrant and bold finish, so your presentation stands out. 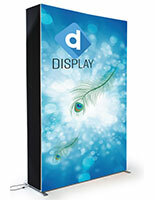 At conventions and expo events, it’s important for your booth to catch the attention of passersby. 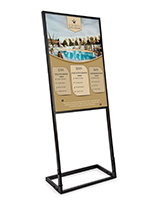 Having your exhibit fixtures incorporating silicone edge graphics will help make that happen. The displays’ special fabric doesn’t give off any glare. 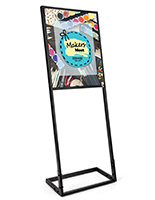 This comes in handy if you’re using a wall backdrop as a background for photography or for streaming video, or you’re using a portable counter to sell merchandise at a sunny outdoor event. 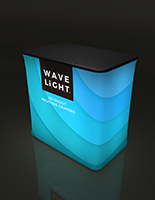 If you’re looking to give your booth modern ambiance, there’s no better type of exhibit fixtures to choose. The frameless appearance on each piece is one that has a clean, yet bold finish — creating a commanding presence in any location regardless it being a portable counter with storage or a large backdrop wall. 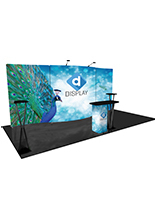 Choosing silicone edge exhibit fixtures to enhance your convention booth is an important aspect of your overall presentation. With their contemporary feel, SEG graphics are a great addition to your space. 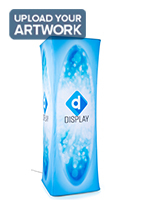 Your dynamic display will have an impact on passersby thanks to the vibrant dye sublimation printing process of the artwork on these exhibit fixtures. Looking for other additions to your convention booth? 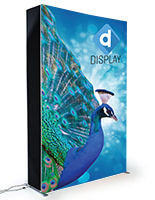 Banners, table displays, and accessories for trade shows are available on our site, along with anything else you might need. 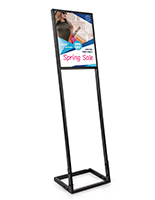 Shop online to create the perfect booth with the help from Displays2go.